This is my favorite cake, and given it is made with Guinness, we are declaring it an Irish cake. 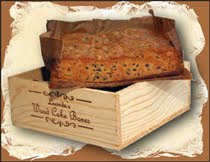 I make it in my famous Lucinda's Wood Cake Boxes, but you can make it in a baking tin, but you still have to line it. Soak fruit and peel in the stout at least 8 hours. Preheat the oven to 300 degrees. Line the cake box with parchment paper, and lightly oil the paper. Drain the mixture through a colander or strainer with a wide mesh, reserving the stout. In the bowl of a mixer, cream the butter and sugar. Mix dry ingredients together and add to the butter and eggs in small batches until the batter is smooth. Dredge the drained fruit and peel, boldly. Coat fruit completely with flour but don’t add extra, loose flour. Fold the dredged fruit gently into the batter. Pour into lined cake box and bake for 1 hour 45 minutes, until firm in the center. I think I must order one-with the triple ginger cake held within.